The Schnauzer is of German origin, said to be recognizable in pictures as early as the 15th century. The Miniature Schnauzer was derived from the Standard Schnauzer and is said to have come from breeding Affenpinschers, Miniature Pinchers, and Poodles with small Standard Schnauzers. In the beginning they were called dwarf pinchers and came in smooth and rough haired types. This is where smaller sized DNA, Parti markings and many colors such as livers and Red/Wheatens were introduced into the schnauzers because poodles,Pinchers and the other breeds carried for all of these even back in the 1800's. The Miniature Schnauzer was exhibited as a distinct breed as early as 1899. Today's Miniature Schnauzer in the United States is an elegant dog of the Terrier Group. While the breed resembles other dogs in this group, almost all of which were bred in the British Isles to "go to ground" to attack vermin of all kinds, his origin and blood are entirely different, giving the Miniature Schnauzer a naturally happy temperament. The breed is hardy, healthy, intelligent, and fond of children. It was developed as a small farm dog, used as a ratter. It's size has permitted it to adapt easily to small city quarters. Miniature Schnauzers have been bred in the United States since 1925 and have gained steadily in popular favor. These guys are stocky, robust little dogs standing 7 to 15 inches at the shoulder, Miniature Schnauzers were bred down from their larger cousins, Standard Schnauzers. Aside from the size difference, the two breeds look much alike. The bushy beard and eyebrows give Minis a charming, human-like expression they’re rugged, muscular & fearless, but not aggressive. Where Do the Smaller Sizes & Different Colors Come From? The Miniature Schnauzer was derived from the Standard Schnauzer and is said to have come from breeding Affenpinschers,, Miniature Pinchers and Poodles with small Standard Schnauzers. 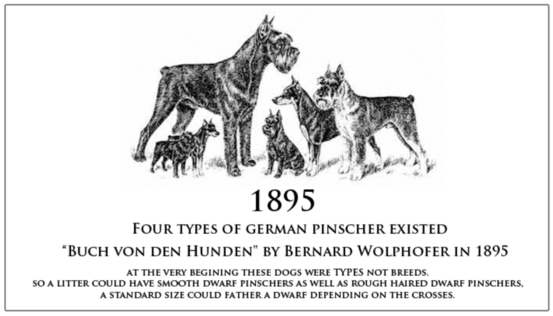 Miniature Schnauzers were first called Dwarf Pinchers in the beginig. Shown above, this is where the Parti markings and many colors such as livers and Red/ Wheatens, Black & Tans, Brindle, Bran & Sables were introduced into the Schnauzers as poodles and the other breeds introduced carried for all of these and more even back in the 1800's. There is even something called speckling shown in the above photo in the chart that goes back to the 1800's. 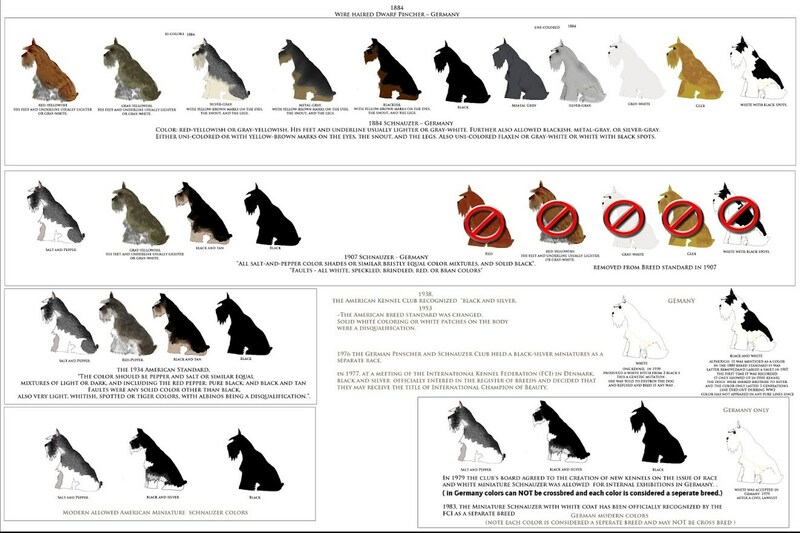 This chart shows the history of schnauzer colors and how they bred away from all the other colors calling them faults. I have also added some old photos shown below of Dwarf Pinchers known as the beginnings of the making of Schnauzers throughout history. Also of some other schnauzers that can be questioned on their coat pattern. There were indeed Merle Dwarf Pinchers/Schnauzers all the way back in the 1800's. They did not look like your modern day schnauzers look now but this is how they were started. Miniature Schnauzers must weigh between 12 – 20 pounds full grown and stand 12 – 14 inches tall to be qualified to enter the show ring. If a Miniature Schnauzer is smaller or larger then this requirement then it is considered a fault by the American Miniature Schnauzer Club. Which just means they can not enter the show ring for competition. Keep in mind that teacup schnauzers and toy schnauzers are miniature schnauzers. There is no separate classification for the toy and teacup sizes as of yet. This means when you register a “teacup or toy schnauzer” their registration papers will show as a purebred miniature schnauzer. The word “teacup” and “toy” is just referring to their smaller estimated adult size and should not be considered a separate classification.